It has finally arrived! Spring is here and I'm most looking forward to blossoms, neighborhood walks, trips for frozen yogurt, front port relaxation, cups of brimming sweet tea, open windows, green grass, floral scents wafting in the air, beginnings of tan lines, outdoor adventures, etc. I haven't even put a dent in the list of favorites that I am so excited for as Mother Nature welcomes a whole new season of beautiful, God-gifted, lovely things. One of my favorites about the changing seasons is the switch-up of clothes. I am so excited to pack away the heaviest of sweaters and down-filled coats and to begin pulling out spring-appropriate clothes and shopping for them too. Who else is with me? 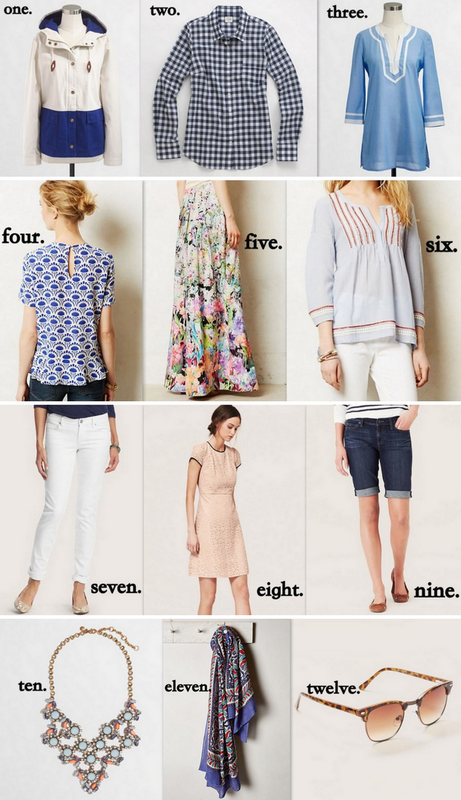 In honor, of the gorgeous spring that awaits us, I've picked out some of my top spring clothing looks. And share what your spring closet staples are.